Your website have a sound/music system? Are you looking for a cool music player? And you are fan of Apple/iPod? 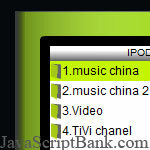 If your answer is 'Yes', let embed this mp3 player script into your web page then let the music play. This package includes seven styles for your choice, beside it also have the ACP version if you are using vBulletin board.